Aberfeldy 1990 (43% abv) is the newest addition to the Exceptional Cask Series, a range of rare and aged whiskies from the Bacardi portfolio. This small-batch single malt whisky is a one-off release, with only 3,126 bottles produced at the Aberfeldy distillery in Scotland. Selected by Aberfeldy malt master, Stephanie MacLeod, the liquid is finished in port casks for two years to allow development of a “unique, highly enjoyable taste profile”. Tasting notes: “Succulent summer berries and aromatic flowering currant, a hint of cinnamon and grated dark chocolate, with a smooth layer of caramel to finish”. 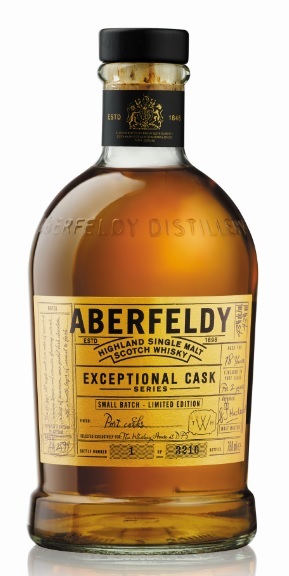 Initially available exclusively at DFS Changi Airport, the Aberfeldy 1999 will be available later in the year at DFS stores at Abu Dhabi airport, in Hawaii and in North America.